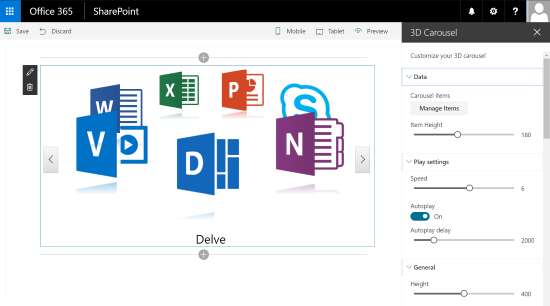 The 3D Carousel Web Part is a SharePoint client side web part built with the SharePoint Framework (SPFx). This web part adds a 3D carousel animation with picture, title and link. This project uses the JQuery plugin jquery.cloud9carousel.js created by R. Cecco. This web part uses also the Custom Fields library to enhance the web part edition experience. Thanks to this WP, you can insert your text, change the radius, the direction, the size, the font, etc. Your title has now an awesome look. Manage items: Collection of carousel items. An item is composed of a Title (mnandatory), a Picture Url (mandatory), a boolean to indicate if the item is enabled or disabled, a link url (optional) and a link text (optional). Autoplay: Automatically rotate the carousel by this many items periodically. Auto-play is not performed while the mouse hovers over the carousel container (default is true). Title Font: specifies the Title font family as Arial, Verdana, etc.